Where peers would be an NTP Server or list of NTP Servers (Internet based, Internal, or mixture of both). If I want to move the PDC Emulator role in my forest root domain to another Domain Controller (in the forest root domain), do I need to configure what will be the NEW PDC Emulator to synchronize to an external NTP source first? Yes you should. Technically speaking you won’t break anything if you don’t, but to avoid all the concerning entries that will go into the Event logs of the new PDC Emulator if you don’t, and also being a best practice, yes you should set it up in advance. In fact some Windows and Active Directory reference books recommend having another Domain Controller in the forest root domain synchronizing with an external NTP source permanently, as a standby PDC Emulator role holder ready for you to transfer the PDC Emulator role to in case something happens to the live one. Microsoft’s website does not appear to recommend this approach however. 1) Configure the Domain Controller in the forest root domain that will be the NEW PDC Emulator to synchronize with an external NTP Source. 2) Move the PDC Emulator FSMO role (and any other FSMO roles) to the new Domain Controller. 3) Revert the original PDC Emulator back to using domain hierarchy for time synchronization using the following commands. On the original PDC Emulator after it is set to use domain hierachy for time synchronization, you will probably see event ID 14 and event ID 29 for sure, and possibly event ID 38 (don’t find a domain controller to sync with), but within 30 mins you should see event ID 37 and event ID 35 indicating it is now synchronizing with a Domain Controller (the PDC Emulator). If you don’t see event ID 37 and event ID 35, see below. How do I know which Time Source my Domain Controllers are syncing with? The long way would be to look at the System Event Log on each Domain Controller and filter by w32time. 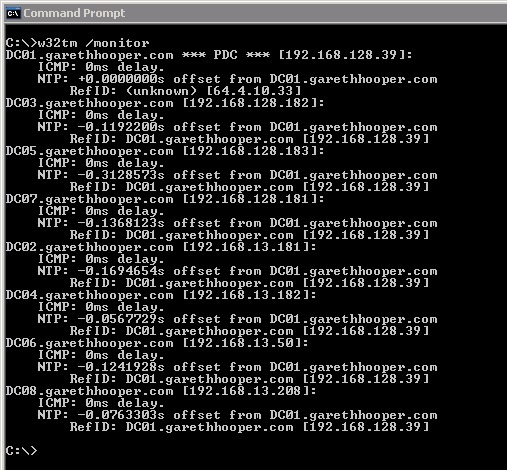 Or the quick way is to run the following command on one of the Domain Controllers. You will see each Domain Controller listed with the Time Source it is configured to use, a Domain Controller (usually the PDC Emulator) or the hostname or IP address of an external NTP Source, in the above case 64.4.10.33. I have Domain Controllers still using the old PDC Emulator for time synchronization, how can I change it to use the new PDC Emulator? This can certainly happen during the transfer of the PDC Emulator FSMO role to another Domain Controller. This is because when the change in PDC Emulator role holder reaches a Domain Controller (other than the new PDC Emulator) it will try and resynchronize it’s time with a “Reliable Time Source” and if it does this BEFORE you have set the original PDC Emulator back to using domain hierarchy as its time source there will be TWO ‘Reliable Time Sources’ in the forest (the NEW PDC Emulator and the ORIGINAL PDC Emulator) and one will be chosen. I have run this test many times and it seems random which Reliable Time Source will be chosen. Microsoft’s documentation on this subject suggests that through a rating system the PDC Emulator of the forest root domain would always be chosen even if there are multiple ‘Reliable Time Sources’. This is not what I discovered through my own testing. Once the original PDC Emulator has been set back to using domain hierachy for it’s time source (and as part of that command, /reliable:no, so it is no longer a ‘Reliable Time Source’) you should run the following command on the Domain Controller to force it to rediscover it’s correct time source. You should now find an event ID 37 and event ID 35 in the Domain Controller’s System event log indicating it is now synchronizing with the PDC Emulator. What happens if I have more than 1 Reliable Time Source? If you have configured multple Domain Controllers as Reliable Time Sources (/reliable:yes), presumably synchronizing with an external NTP Source, your Domain Controllers set to use domain hierachy as their time source will randomly synchronize with one of the Reliable Time Sources. This probably won’t be a problem. Of course, if for whatever reason each Domain Controller that is set to be a Reliable Time Source actually differ in time by more than 5 mins (Kerberos max allowed time difference) then of course this will cause problems. Will the PDC Emulator synchronize with an external NTP Source if the time on the external NTP source differs by more than 5 mins? By default YES it will. In fact, by default any Domain Controller (or Windows Server) set to use an external NTP Source will STILL synchronize if the time differs by over a year! I have personally tested this scenario. In my lab environment, I set a PDC Emulator to synchronize with an non-existent NTP Source and then changed its clock to be 1 year ahead (all other Domain Controllers synchronizing with the PDC Emulator also changed ahead by over a year to be synchronized with the PDC Emulator). I then changed the PDC Emulator to synchronize with a real NTP Source and it changed it’s clock back by over a year (again the other Domain Controllers followed suit with the PDC Emulator). When the clock goes forward more than your tombstone period (60 – 180 days depending on which verson of Active Directory your forest was created with) it creates replication problems, but that is a different article, see Replication error 8614 The Active Directory cannot replicate with this server because the time since the last replication with this server has exceeded the tombstone lifetime. What happens if my PDC Emulator is synchronizing with an NTP Source that is down or no longer exists? Assuming that the PDC Emulator of the forest root domain is the only Reliable Time Source, then this won’t cause a problem other than the fact that the time is not correct, or will eventually not be correct as the Server’s clock is not perfect. Replication will work fine, all the Domain Controllers, Servers, and Desktops in the forest ultimately derive their time from the PDC Emulator of the forest root domain. If that isn’t synchronizing with an external NTP Source, then other than w32time related entries in the PDC Emulator’s System event logs, everything will continue to work.